ECG was invented more than 100 years ago. 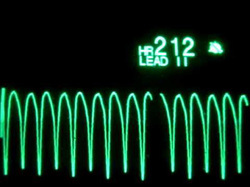 Despite many technical advances in the field of emergency cardiology, the basic 12-lead ECG still remains a cornerstone test in the acute diagnosis of many types of cardiac conditions, both acute and chronic. Automated ECG analysis was initiated in the 1950s in an attempt to assist providers who had less training in ECG interpretation. Unfortunately, despite improvements in the automated interpretations over the past 60 years, computer ECG interpretations remain far from perfect. Despite the common teaching that we should not trust the computer interpretations, many healthcare providers still rely heavily on these interpretations in their clinical practice. The following review provides some excellent information regarding the benefits and limitations of the computer interpretation programs. The authors reviewed technical specifications about the various computer programs and also numerous articles regarding accuracy data on the various algorithms. The following is a list of key points they made. There is no international accepted standard for computer interpretations. As a result, significant variability exists among interpretations from different manufacturers' algorithms. Direct comparative evaluations of the various commercially available computer-interpreted ECG (CIE) programs has never been performed. A 1991 study of nine CIE programs versus eight cardiologists demonstrated consistently lower accuracy among the CIEs compared with the cardiologists, and also (surprisingly) significant variation in accuracy among the various programs. CIE programs have a frequent tendency to overcall atrial fibrillation, especially in elderly persons, potentially leading to inappropriate administration of harmful medications. CIE programs have a tendency to double-count the rate due to large T-waves (eg, in the setting of hyperkalemia). CIE programs are particularly inaccurate in diagnosing pacemaker rhythms. CIE programs demonstrate wide variations in the false-positive (0%-42%) and false-negative (22%-42%) rates of diagnosis of ST-segment myocardial infarction; therefore, it is not recommended that CIEs be used as a sole means of activation of the cardiac catheterization lab. CIE programs frequently tend to underestimate the QT interval, especially in the presence of artifact or improperly placed leads. The authors cite a 2008 study indicating that "It has been roughly estimated that [CIE] misdiagnoses may account for up to 10,000 adverse effects or avoidable deaths worldwide annually." The authors summarize, "Computer-based analysis of the ECG may lead to erroneous diagnosis with useless, inappropriate, or even dangerous care of the patient." 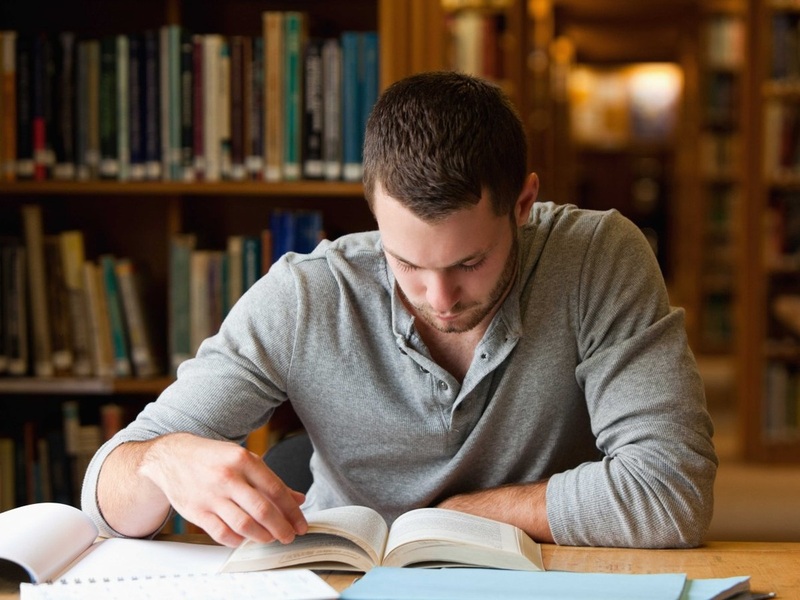 This article sheds some much-needed light on the true accuracy of CIE programs. Although these programs may help providers who are inexperienced in ECG interpretation, they appear to decrease the accuracy of experienced providers by frequently providing a false sense of security with benign interpretations and also by encouraging less scrutiny of the ECG. I truly believe that if the computer interpretations were removed, providers would pay closer attention to the ECG, resulting in more accurate interpretations and fewer errors. I also believe that our trainees would feel compelled to work harder at their ECG interpretation skills if the computer interpretations were removed. During the past 15 years, I've seen at least a half-dozen malpractice cases in which the computer interpretation simply indicated "nonspecific" findings on ECGs that demonstrated fairly obvious ischemia. In each of these cases, the treating physician was misled by the computer, and only in retrospect, too late, did the physician recognize the ischemic findings. These cases are typically nearly impossible to defend. ECG interpretation is a life-saving skill. Proficiency is a must for us all. We must exercise extreme caution regarding the utility of these CIE programs and gain enough skill and confidence to avoid using them entirely. Al Ghatrif M, Lindsay J. A brief review: history to understand fundamentals of electrocardiography. J Community Hosp Intern Med Perspect. 2012;2. Mele PF. The ECG dilemma: guidelines on improving interpretation. J Healthc Risk Manag. 2008;28:27-29. Cite this article: How Computer-Interpreted ECGs May Lead to Errors - Medscape - Nov 28, 2017. Interesting study. May be more applicable to the ED setting compared with the sterile, controlled environment of the operating theatre with semi-elective fasted patients. In the largest prospective, randomized trial to date, use of video laryngoscopy improved glottic visualization but did not increase procedural success or decrease complications compared to direct laryngoscopy in medical ICU patients. Source: Janz DR, Semler MW, Lentz RJ, et al. Randomized trial of video laryngoscopy for endotracheal intubation of critically ill adults. Crit Care Med 2016;44:1980-1987. AKA - The FELLOW trial (Facilitating EndotracheaL intubation by Laryngoscopy technique and apneic Oxygenation Within the ICU). Design: A randomized, parallel-group, pragmatic trial of video compared with direct laryngoscopy for 150 adults undergoing endotracheal intubation by Pulmonary and Critical Care Medicine fellows. Setting: Medical ICU in a tertiary, academic medical center. Patients: Critically ill patients 18 years old or older. Interventions: Patients were randomized 1:1 to video or direct laryngoscopy for the rst attempt at endotracheal intubation. Measurements and Main Results: Patients assigned to video (n = 74) and direct (n = 76) laryngoscopy were similar at baseline. Despite better glottic visualization with video laryngoscopy, there was no difference in the primary outcome of intubation on the rst laryngoscopy attempt (video 68.9% vs direct 65.8%; p = 0.68) in unadjusted analyses or after adjustment for the operator’s previous experience with the assigned device (odds ratio for video laryngoscopy on intubation on rst attempt 2.02; 95% CI, 0.82– 5.02, p = 0.12). Secondary outcomes of time to intubation, lowest arterial oxygen saturation, complications, and in-hospital mortality were not different between video and direct laryngoscopy. Conclusions: In critically ill adults undergoing endotracheal intuba- tion, video laryngoscopy improves glottic visualization but does not appear to increase procedural success or decrease complications. Limitations: The small but significant population of patients excluded from randomization in the FELLOW trial due to urgency or clinician judgment unfortunately limits the generalization of these findings to other high-risk populations. Perhaps we shouldn’t throw out our Mac laryngoscopes yet. Look at the below link to NEJMs “Quick Take” and article. The results of this study seem practice changing, but probably are not (see analysis below). Prospective study. 11 Italian hospitals, 560 patients presenting with first syncope. All underwent CXR, ECG, Well’s Score assessment and D-Dimer testing (not age adjusted, as far as I can see). A total of 560 patients (mean age, 76 years) were included in the study. Pulmonary embolism was ruled out in 330 of the 560 patients (58.9%) on the basis of the combination of a low pretest clinical probability of pulmonary embolism and negative d-dimer assay. Among the remaining 230 patients, pulmonary embolism was identified in 97 (42.2%). In the entire cohort, the prevalence of pulmonary embolism was 17.3%. Evidence of an embolus in a main pulmonary or lobar artery or evidence of perfusion defects larger than 25% of the total area of both lungs was found in 61 patients. Pulmonary embolism was identified in 45 of the 355 patients (12.7%) who had an alternative explanation for syncope and in 52 of the 205 patients (25.4%) who did not. Of the 97 patients with pulmonary embolism, 24 (24.7%) had no clinical manifestations of the diagnosis, including tachypnea, tachycardia, hypotension, or clinical signs or symptoms of deep-vein thrombosis. Pulmonary embolism was identified in nearly one of every six patients hospitalized for a first episode of syncope. This is not a cohort of 97 pulmonary embolisms in 560 patients as it has been portrayed. Rather this was 97 (3.8%) radiographic pulmonary embolisms in 2584 patients presenting to the Emergency Department for a syncopal event. Only the patients admitted to the hospital after an Emergency Department workup for syncope were enrolled into the PESIT cohort. The majority of patients presenting to the Emergency Department were discharged home without further workup. This means 1 in 26 patients presenting to the Emergency Department will have a pulmonary embolism found on imaging. The large majority of these will be incidental findings and the remainder will be clinically obvious. "There are times when our clinical experience is misleading. When empiric evidence should call into question our long standing practice patterns. But there are times when the evidence is in such conflict with our shared experience, there is nothing to be done but to questions its validity. There is no doubt that these results will be misinterpreted over the next few days, weeks and years. We will now be tasked with performing invasive diagnostic workups in patients with no clinical signs or symptoms of pulmonary embolisms. Any Emergency Physician will tell you not to order a CTPA on a patient in whom you do not wish to know the results. Likewise, do not order a D-dimer in a patient who you have no intention of acquiring further imaging. Prandoni et al have perpetrated the systematic equivalent of this diagnostic absurdity. To translate these results into meaning that all patients presenting to the Emergency Department after a syncopal event require a work-up for pulmonary embolism is not only statistical hoodwinkery, but is just bad medicine. These patients will be exposed to needless and harmful downstream workups, radiation and anticoagulation. We have chased the ghost of Pulmonary Embolism far beyond the reaches of good clinical practice. And this quixotic quest has left a path of over-diagnosis and unnecessary treatments in its wake. At some point someone has to stop this madness. I offer that time is here and now”. Maybe not so practice changing after all. Amal Mattu: IV Amiodarone for WCT: Time to Say Goodbye? Intravenous amiodarone was introduced to mainstream acute care providers in the resuscitation guidelines released in 2000. It was touted as the drug of choice for treating wide complex tachycardia (WCT) of various types, especially for monomorphic ventricular tachycardia (VT). Because it suppresses ventricular conduction and also has atrioventricular nodal blocking effects, it was presumed effective for other types of WCT as well, and it quickly became the preferred therapy for all undifferentiated WCT. However, in recent years, studies have cast some doubt on the effectiveness of this drug. The most recent study of amiodarone vs the older drug procainamide has perhaps added one more nail in amiodarone's coffin. Ortiz and colleagues sought to compare the efficacy of amiodarone vs procainamide in patients with hemodynamically stable, regular WCT. The exact diagnosis (eg, VT vs supraventricular tachycardia with aberrant conduction) was not the focus of the study, given that in real-world scenarios the real diagnosis is typically uncertain, and no ECG criteria have been found to be reliable in this distinction. The authors performed a multicenter, randomized, open-label study in which a total of 29 patients received amiodarone (5 mg/kg over 20 minutes) and 33 patients received procainamide (10 mg/kg over 20 minutes). The primary endpoint was the incidence of major cardiac adverse events (clinical signs of peripheral hypoperfusion, signs of acute heart failure, development of severe hypotension, tachycardia acceleration of >20 beats/min, or appearance of fast polymorphic VT) within 40 minutes after beginning the infusion. Response to treatment was defined by conversion of the WCT to the patient's known or presumed usual heart rhythm within the study period. The primary endpoint occurred in 12/29 (41%) in the amiodarone group vs 3/33 (9%) in the procainamide group. Tachycardia termination occurred in 11 (38%) in the amiodarone group and 22 (67%) in the procainamide group. In the following 24 hours, adverse events occurred in 31% of the amiodarone group vs 18% of the procainamide group. Among 49 patients with structural heart disease, adverse events occurred more commonly in the amiodarone group as well (43% vs 11%). This study demonstrated that procainamide was more effective and safer than amiodarone for patients with WCT, including those with structural heart disease. Although this is the first controlled prospective trial comparing procainamide vs amiodarone, this is not the first study that has cast doubt on the effectiveness of amiodarone in WCTs. Previous studies by Marill and colleagues and Tomlinson and colleagues demonstrated that amiodarone was only effective in 29% of cases of stable VT. In 2006, the American College of Cardiology, the American Heart Association, and the European Society of Cardiology endorsed procainamide as the preferred drug for stable monomorphic ventricular tachycardia; and in 2010, the American Heart Association resuscitation guidelines followed suit. With respect to irregular WCT, amiodarone is contraindicated when there is concern for atrial fibrillation with pre-excitation. For treatment and conversion of stable narrow complex atrial fibrillation as well, procainamide has received strong support and is commonly used in Canada. Admittedly, procainamide is not a perfect drug either. Rapid administration can induce hypotension or prolongation of the QRS or QT intervals, leading to (rarely) torsades de pointes. However, the habitual use of amiodarone in patients with undifferentiated WCTs is not well-supported by the literature. Amiodarone is poorly effective in VT; and it is dangerous in pregnancy (class D), in prolonged QT conditions, and in patients with atrial fibrillation plus pre-excitation. Safer drugs are available; and, when in doubt, acute care providers should not hesitate to sedate and cardiovert patients with WCTs. It's time to let amiodarone rest in peace and, if available to you, get reacquainted with an old friend, procainamide. [No authors listed]. Guidelines 2000 for Cardiopulmonary Resuscitation and Emergency Cardiovascular Care. Part 6: advanced cardiovascular life support: section 5: pharmacology I: agents for arrhythmias. The American Heart Association in collaboration with the International Liaison Committee on Resuscitation. Circulation. 2000;102(8 Suppl):I112-I128. Field JM, Hazinski MF, Sayre MR, et al. Part I: executive summary: 2010 American Heart Association guidelines for cardiopulmonary resuscitation and emergency cardiovascular care. Circulation. 2010;122(18 Suppl 3):S640-S656. January CT, Wann LS, Alpert JS, et al; ACC/AHA Task Force Members. 2014 AHA/ACC/HRS guideline for the management of patients with atrial fibrillation: executive summary: a report of the American College of Cardiology/American Heart Association Task Force on practice guidelines and the Heart Rhythm Society. Circulation. 2014;130:2071-2104.7. Cite this article: IV Amiodarone for WCT: Time to Say Goodbye?. Medscape. Oct 05, 2016. Does intubation during paediatric cardiac arrest save lives? Brand new article published in JAMA - looks at the association between intubation and outcome during in-hospital paediatric cardiac arrest. Sure, it's not an RCT but being such a rare event, will we ever have one? Go to the website to download the (non-paywalled) article. 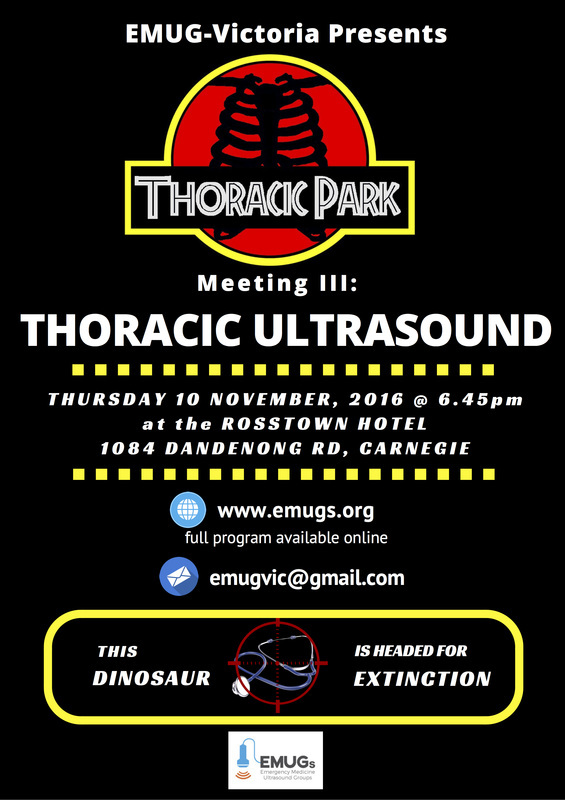 Guys the next EMUG Victoria (Emergency Medicine Ultrasound Group) meeting is fast approaching on Thursday November 10. It is FREE for trainees and is being organised by some local experts including Dr. Pourya Pouryahya, Carolynne Cormack and myself. Check out the website (www.emugs.org) and register on the website ASAP, and bring some non-Monash friends! Some of you may have seen this document from the College of Radiology (free download). Of particular interest is the turn-around regarding contrast induced nephropathy. R4. Intravascular iodinated contrast media should be given to any patient regardless of renal function status if the perceived diagnostic benefit to the patient, in the opinion of the radiologist and the referrer, justifies this administration. R5. Emergency imaging procedures requiring contrast media administration e.g. acute stroke, acute bleeding, trauma etc. should not be delayed in order to obtain renal function testing results prior to the procedure. R6. The risk of intravenous contrast media related acute kidney injury (CI-AKI) is likely to be non-existent for patients with eGFR greater than 45 mL/min/1.73m2.No special precautions are recommended in this group prior to or following intravenous administration of iodinated contrast media. R7. The risk is of intravenous CI-AKI is also very likely to be low or non-existent for patients with eGFR 30 - 45 mL/min/1.73m2. Universal use of periprocedural hydration in this group to prevent the theoretical risk of CI-AKI cannot be recommended but patients with impaired function in this range that is acutely deteriorating rather than stable may benefit from this intervention. R8. In patients with severe renal function impairment (eGFR less than 30 ml/min/1.73m2) or actively deteriorating renal function (acute kidney injury) careful weighing of the risk versus the benefit of iodinated contrast media administration needs to be undertaken. Consideration should be given to periprocedural renal protection using intravenous hydration with 0.9% saline (see relevant section). However, severe renal function impairment should not be regarded as an absolute contraindication to medically indicated iodinated contrast media administration. Next time your friendly radiology registrar gives you a hard time, you can give give them some of their own medicine. Want a better work/life balance? Hint – it’s not about being better at multitasking. I am tired of hearing about balance. We talk about it, we go to lectures on it, we give mandatory presentations on it to our interns. Yet few people would say they have actually achieved this elusive, zen state. In fact, more than 70% of ER doctors have signs of burn-out  – the opposite of balance. Too many presentations on balance give insipid suggestions to “make sure you exercise and eat well,” or “find time to sleep.” I can’t imagine that advice would be very helpful to someone who is already burning out and living in the margins of their free time and energy. Something is wrong with this picture. First of all, let’s look at the language we use. We all talk about “finding” balance. Where did it go? Did we lose it? Did we used to have it? I imagine that we did used to have balance. Perhaps it was when we were in college, or in medical school. Maybe it ended when residency started, or perhaps when we started having kids. At some point, we jumped onto a treadmill called ‘career’. We ambled along, excited at our new position. Then that treadmill started to move a little faster. If you had a kid or four, then it felt like running on the treadmill carrying the kids with you. If you are like me, you have started to notice signs of burnout. The struggle is real. At work we have to take care of difficult and violent patients, meet core measures, chart, and deal with patient complaints. After our shift ends we come home to kids, errands, bills, and all the household stuff, like cooking something other than grilled cheese for dinner. I hear these refrains day after day, yet we all still seek this elusive thing called balance, as though we were in search of a mystical unicorn that we’ll never find. Why have we arrived at this state of perpetual imbalance? What can we do to start to reclaim our own wellness and find this mysterious balance? Here are some suggestions, not from someone who has figured it all out, but as someone who is in the thick of it, striving to do better. Balance should not be seen as ’doing it all’. A balanced life does not mean being in five different leadership roles at work while also coaching your kid’s soccer team, sewing hand-made Halloween costumes and growing your own organic vegetables. If we define balance as doing everything and doing it well, we are bound to fail. Perhaps we should define balance as living a life that meets your own personal goals, understanding that there will have to be compromise. Your ideal life may look like 12-hour workdays, and frequent travel in order to reach further leadership positions at work. Someone else’s might look like working part time and spending more time with kids, or working close to quarter-time to have time to homeschool. We need to define what our own personal goals are, and then try to bring our lives more into alignment with them. Now obviously, we can’t define away doing medical charts, or define a higher salary for ourselves. There are financial realities and time constraints we have to deal with. We need to figure out what we want and what is negotiable in terms of hours, responsibility, pay, and time. When the pie chart of what you are actually doing matches the pie chart of your priorities – that is balance. Ask yourself what floats your boat? What gets you up in the morning (figuratively, not what actually gets you up, which is probably a loud alarm, children, and coffee)? It is easy to say yes to so many things that crowd out what you really love. That one committee that will meet once a month? Reviewing a paper? Giving a lecture? These are all good things. But they can easily squeeze away the time we have for more important things. If it is something you love and are passionate about, then do it! If it is something that you have no choice about and have to do in order to meet your other goals that you are passionate about, then do it! If you don’t really want to, and you don’t have to, then say no. Those little things can add up and tip your balance. You are not a super hero with inhuman strength or stamina. Give yourself permission to say no to things. Cull what drags you down, and focus on the things that you love, both at work and at home. If you are so burned out that you feel nothing brings you joy, then seek help, seek friends, find people to reflect with you and remember what used to bring you joy. Give yourself permission to live your life to meet your own goals, not the goals of the other people in your department, or in your Facebook feed. There’s a phrase used by non-profit organizations about keeping out of the red that applies well to us as physicians: “No margin, no mission.” If you are constantly over-extending then you may burn out and could risk losing your mission. Plus, life is just too short to spend it doing things you hate. There is no prize at the end of your life for the person who ran the fastest on that career treadmill. What do you want to be able to look back on and be proud of? Perhaps it is something related to your career, making a difference in your community, or the patients’ lives you have saved. But maybe it will also be the time you have spent with friends and family. To paraphrase Dr. Mike Myer , think more about your eulogy than your CV. Balance and wellness can be hard to maintain because our lives keep changing. Perhaps for a short season we feel like we have captured balance, and we feel good. We are exercising and eating a paleo diet, and even have time to watch something on “the Netflix”, of which I hear tell. But then we lose it again. Our shifts change, our schedules change, and the pie chart of our goals changes. The needs of our family also change. Your baby has gone from needing diaper changes to needing homework help. So maintaining wellness requires a constant evaluation of our lives, a constant pruning of things that are no longer helping, and nurturing growth in other areas. As a group, we perpetuate the ideal of doing it all, rather than living a life that is in line with our goals. We applaud people who seem to be doing everything. Perhaps instead of just saying: “Congratulations on taking on that 500th responsibility,” we should also ask, “Are you able to maintain your own wellness with all that’s on your plate?” When we see colleagues who are starting to burn out, let’s reach out to them. Burnout is incredibly prevalent, and increases the risk of substance or alcohol abuse, medical errors, and suicide. The equivalent of over three medical school classes of physicians commit suicide every year ! The number one reason for burnout among physicians is bureaucratic tasks . It is not taking care of patients – that’s what we trained for a decade to do. It is the system that surrounds care delivery that is making doctors lose job satisfaction and sometimes leave medicine all together. There are many things that could be done at all levels to reduce burnout, from institutional support for things like charting (let’s get scribes), core measures (let’s build systems in our EHR that make it easier), work hours (let’s schedule shifts to allow fewer day/night transitions). There is plenty more that could be done at even higher levels, but most of us have little control over those things. What we can control is our own attitudes and our interactions. Let’s build wellness into the fabric of our own lives, our departments, and our residency training. Let’s start being realistic. Instead of talking about how to stay “balanced” while doing it all, let’s talk about what we need to do to maintain wellness, resiliency, and longevity in our lives and careers. The first step may be to figure out what the ideal pie-chart of time expenditures would look like for you to be well. Define it for yourself, pursue it, choose it, and encourage it in others. 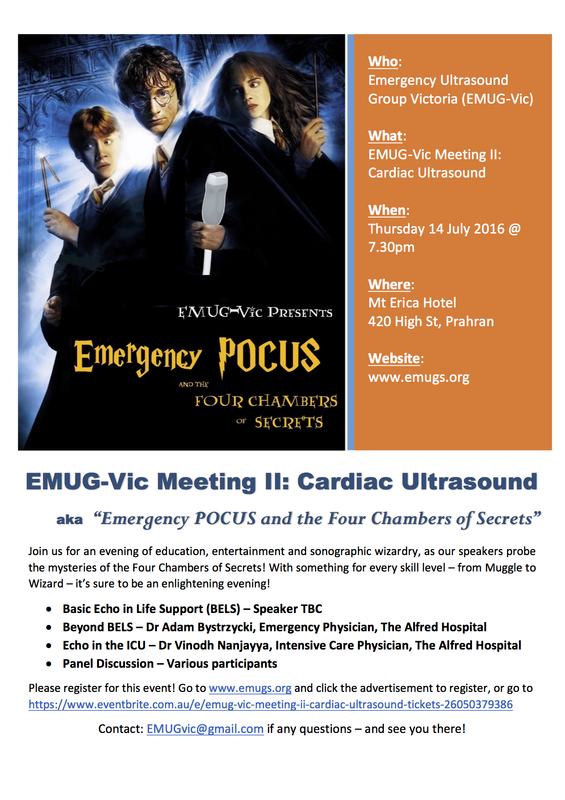 Guys the next EMUG (Emergency Medicine Ultrasound Group) meeting is fast approaching on July 14. It is FREE and is being organised by some local experts including Melody Hiew and Anthony Wald. Check out the website (www.emugs.org) and register on the website ASAP, and bring some non-Monash friends! Guys the May 25th journal club articles are posted on the website. Make sure you read them before then, as the presenters will be asking you questions, or as the Americans say, "pimping!" The first article is on albumin replacement in sepsis and septic shock. Of course the aim is to restore circulation without causing interstitial fluid edema, which is associated with worse outcomes. Does it work? 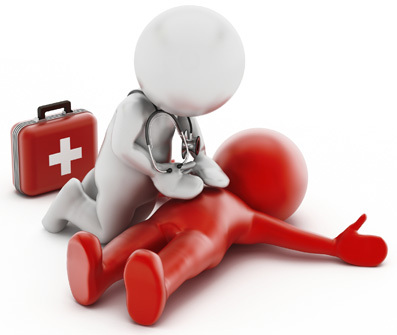 The second is on pre-hospital intubation in non-traumatic cardiac arrest (OOHCA). Is is better than using supraglottic devices eg laryngeal masks? Certainly it takes more training and skill to perform endotracheal intubation than insertion of a SGA but does it save lives? We will review the meta-analysis that aimed to answer this question.